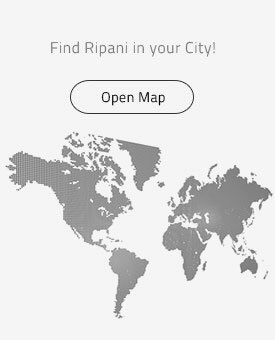 For the last 50 years, RIPANI has designed, produced and signed bags and accessories in leather and in the most exclusive and fashionable materials, exporting its creations all over the world. This family company was founded in 1967 and, since 1994 the last generation has led with passion its business to success in the new headquarters in Tortoreto Lido (TE): a highly modern and technologically advanced factory of 3200 sq.m.Thanks to the passion of the family, the prestige of its brand and the originality of its creations, RIPANI holds a prominent position in the Italian and international scene and focuses its business strategies to corner new markets.The careful search for materials, the exclusive design in steady evolution and the undisputed Italian artisanal skills make RIPANI style and design unique and distinctive. L RIPANI’s technological innovation and artisanal work ensure top quality Made in Italy products. “Made in Italy” is for RIPANI not only the mere production in its factory but also a different philosophy that consents to achieve high standards of living for its employees, as well as the care for environment and the safety for its customers.The company is located in Tortoreto an ancient town in the centre of Italy, on the Adriatic coast, where the RIPANI family has its roots and still lives. This special place, among sea, mountains and history, represents a daily inspiration for RIPANI creative mind. In 1999, located in its headquarters, the RIPANI family created the Historical Leather Goods Museum to tell the story of Italian leather tradition and share two centuries of culture: an extraordinary journey among bags, vanity and suitcases, as well as other original leather goods; more than 100 precious pieces going from 1800 to nowadays.